The LOEWE Research Focus "Extrajudicial and Judicial Conflict Resolution", founded on January 1st 2012, is a temporary joint research project of scientists at the Johann Wolfgang Goethe-University and the Max Planck Institute for European Legal History, and of the Frankfurt University of Applied Sciences. An associated Partner is the Society for Imperial Chamber Court Research (Wetzlar). 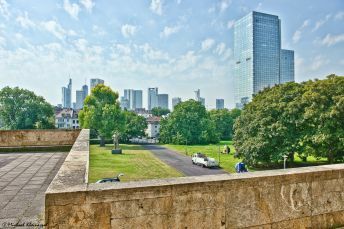 The joint research of legal historians, historians, comparatists-at-law and sinologists strives for a permanent structural formation at Frankfurt as important research location, being the starting point of sustainable interdisciplinary research concerning normativity. The joint comparative research project is aimed at interdisciplinary and international analysis of conflicts, conflict activities and conflict resolutions in different epochs and dissimilar cultures. Main topics are Europe, the United States, Latin America and Asia. By the cooperation of legal history, jurisprudence, history and sinology, archetypes and modes of conflicts and conflict resolutions are verified based on historical and empirical findings and consequently the bases are created for theories adapted from structural experiences. An expert council formed from practitioners in extrajudicial and judicial conflict resolution acts as kind of sounding board and as an innovative instrument of academic-political-social dialogue. The Research Focus has a wide range of topics. Its individual research projects include such wide-ranging areas as the ancient Near East; Hellenistic Egypt; Europe as a trading location in the Middle Ages and early modern period; the New World in the 16th Century; the cities of Europe in the early modern period; the "Old Reich" and its territories; England in the 18th and 19th Centuries; Germany; international law in the 19th and 20th Centuries; China in the late imperial era; the United States; and today's Japan. An international fellowship and an ambitious programme of support for young postdoctoral and doctoral candidates, including a junior research group, complete the research in the Research Focus. Prof. Dr. Moritz Bälz, LL.M.